The 2009 Commission on the Measurement of Economic Performance and Social Progress (“Stiglitz-Sen-Fitoussi” Commission) concluded that we should move away from over-reliance on GDP when assessing a country’s health, towards a broader dashboard of indicators that would reflect concerns such as the distribution of well-being and sustainability in all of its dimensions. 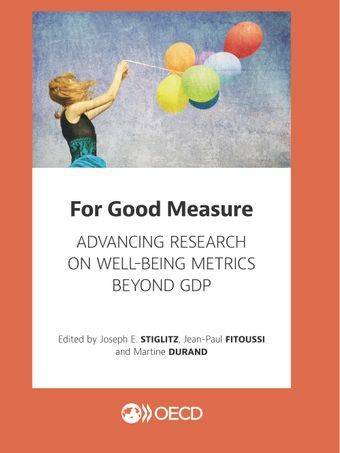 This book includes contributions from members of the OECD-hosted High Level Expert Group on the Measurement of Economic Performance and Social Progress, the successor of the Stiglitz-Sen-Fitoussi Commission, and their co-authors on the latest research in this field. These contributions look at key issues raised by the 2009 Commission that deserved more attention, such as how to better include the environment and sustainability in our measurement system, and how to improve the measurement of different types of inequalities, of economic insecurity, of subjective well-being and of trust.A companion volume Beyond GDP: Measuring What Counts for Economic and Social Performance presents an overview by the co-chairs of the High Level Expert Group, Joseph E. Stiglitz, Jean-Paul Fitoussi and Martine Durand of the progress accomplished since the 2009 report, of the work conducted by the Group over the past five years, and of what still needs to be done.